Is it time to treat your cattle or sheep for fluke? Posted on 14th January 2019 at 5:06 pm. Liver fluke infection in Ireland can be an all year-round problem. However, this time of year can be particularly problematic after the mild summer and autumn we just experienced. Liver fluke may cause a reduced meat production of up to 20% in cattle, 30% in sheep and a reduction in milk production of 8% in dairy cows. Animals initially pick up infection by ingesting larvae from grass on typically wet/marshy land. Development into the infective stage is helped along by an intermediate host, the mud snail. Larvae eventually leave the mud snail, encyst on grass and are ingested. Once in the gut, they penetrate the intestinal wall and move directly to the liver where they develop into adults in the bile ducts. This process takes 8-12 weeks during which significant damage to the liver occurs as the fluke migrate. Egg production starts in the bile ducts, eggs are released into the small intestine and finally onto pasture, continuing the cycle of infection. Obvious signs of fluke infection include bottle jaw, anaemia, poor thrive and weight loss. Severe infections can trigger clostridial disease resulting in sudden death or even aggravate conditions such as salmonellosis. If animals were treated for fluke at housing and are showing signs of infection, now is the time for another treatment. Dung samples from individuals or a group of animals is a common method of diagnosis. However, a negative result does not completely rule out infection as immature fluke might be present which may not have had the chance to produce eggs. A Bulk milk tank ELISA test can also be considered as well as data analysis from abattoirs. When treating, it is important to look at what active ingredient is in the product and what stage of the lifecycle it is effective against. Zanil contains the active ingredient Oxycloxzanide which is effective against adult flukes present in the bile duct of the animal and is also effective against tapeworm segments. 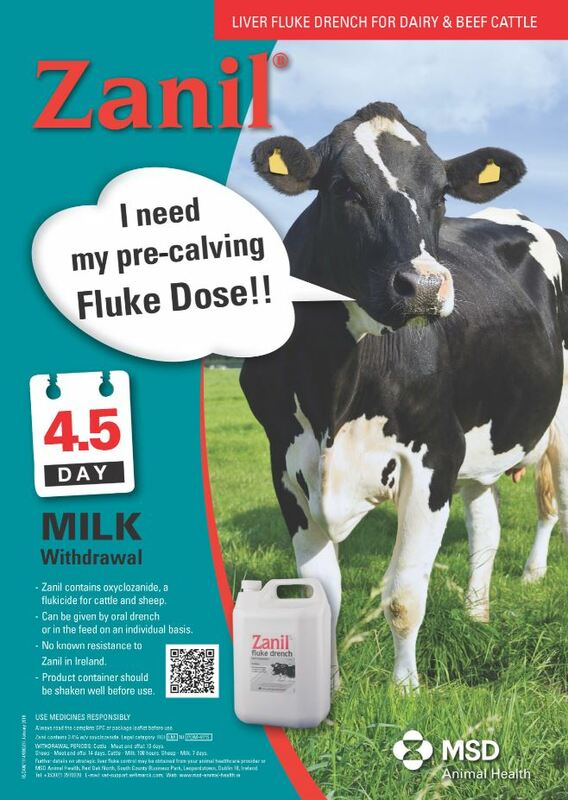 Fluke treatment with Zanil is commonly given this time of year as adult flukes are often present now, 8-12 weeks after housing. Zanil can be given as an oral drench to both cattle and sheep as well as pregnant and lactating animals. As with all oral drenches, it is important to dose as accurately as possible to the weight of the animal. For cattle, the dose is 3ml/10kg up to 350 kg. For cattle > 350 kg a maximum dose of 105 ml must be given. For sheep, the dose is 4.5 ml per 10 kg up to 45 kg. For sheep > 45 kg the maximum dose is 20 ml. Withdrawals for cattle include a 4.5-day milk withdrawal and 13-day meat while sheep have a 7-day milk withdrawal and 14-day meat.